Josh Davies was officially named Police Chief of the Rio Grande Police Department. He is pictured here with his police canine Smilla. RIO GRANDE — The Village of Rio Grande has named a new police chief after former Chief Chris Dodson resigned from the role. Josh Davies was promoted and took office Jan. 1. Dodson stepped down from the role, which he served in as a part time employee, because of a change in policy with his full time employer, Ohio Department of Natural Resources. ODNR recently changed their policy regarding officers with more than one commission, limiting them to a single commission. Because of this policy change, Dodson elected to step down from his role with RGPD as a commissioned officer/police chief. Davies began with the village police department as a part time patrolman in April of 2009 and was promoted to full time status in January of 2012. Since then, he became a K9 handler in June of 2012, was named sergeant in August of 2011, and promoted to lieutenant in April of 14. While not originally from the area, Davies travelled a lot as a child with his mother who was in the military. 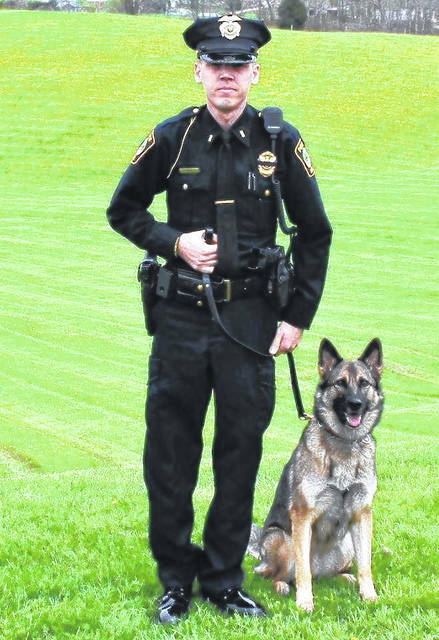 After graduating from high school in 2002 he attended the police academy in 2006-07 when he was issued his first deployment by the Gallia County Sheriff’s Office. He did attend River Valley High School as a freshman. Davies has respect for the previous administration and hopes to continue to build on the success of the department. Currently RGPD only has one full time officer and nine part time officers. Davies hopes to add full time officers to increase their presence in the village and protect citizens. They also take advantage of several auxiliary officers to help offer protection and service to Rio Grande.